So we're going to bump it up a little more today with an 8x8 inch collage. 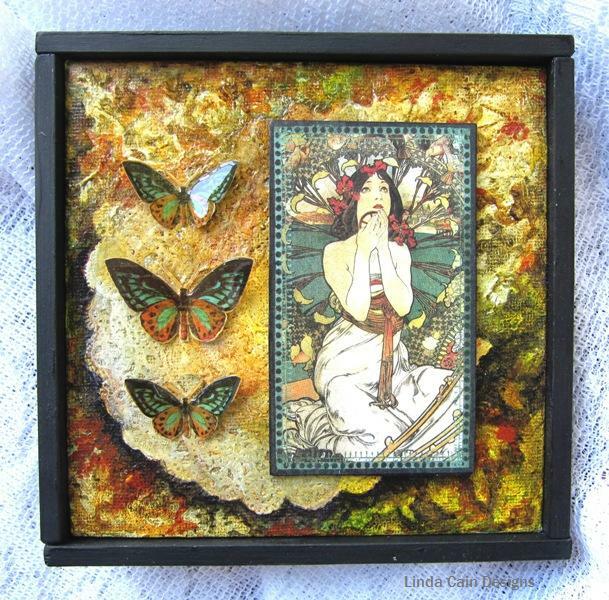 Yep, this was really full of layers and layers....paint, tissue paper, stamping, and glazes, resulting in a lighter pastel piece that framed up rather well. Want to see how it came to be??? Check it out here, and enter to win a set of STAMPS, either 1 x A5 set, or 2 x A6 sets, or 3 minis, chosen at the end of the week. These are just a couple of the steps in the tutorial to reach this light and airy piece. LOVE this little Blowfish Hot Air Balloon, don't you? And we'll lay down a base with Moldeling Paste to give it even more texture. So give it a go, take a look, and as always, let us know what you think! More fun from Retro Cafe Art. This is a Stand Up Heart- Extra Large that comes with 2 pieces of Masonite here. The Cupid is from a set of 6 here. And the Medium Winged Hearts here. Other small Hearts are from the Heart Mix Set of 36 here. And the papers are from Bo Bunny-Love Letter 6x6 pad here. 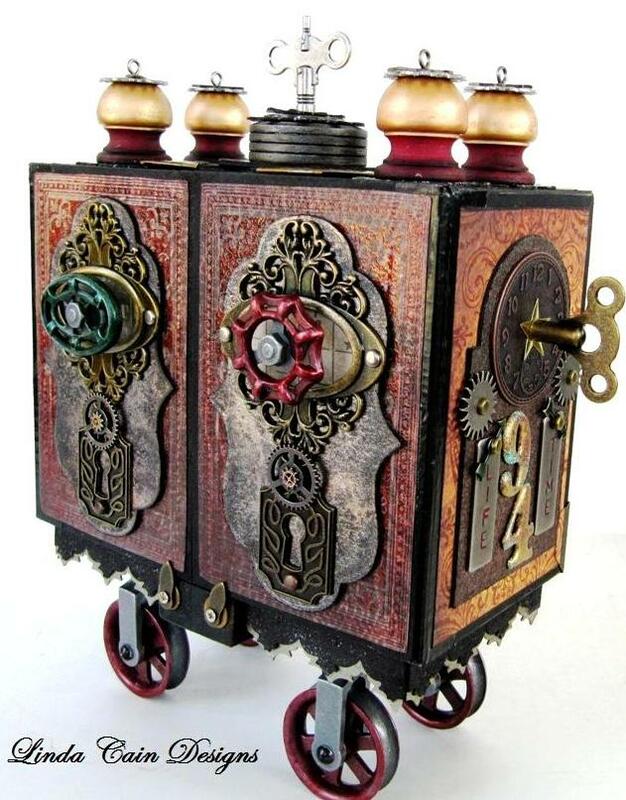 Fresco Finish Paints from PaperArtsy - London Night, Vintage Lace, and Claret. Ultra-Thick Embossing Powder (UTEE) - Clear, Gold, and Bronze. (just a note about the paints...they come in Translucent, Opaque, and Semi-Opaque formulas each working for a different ending. The Opaque Vintage Lace lays the base and the Claret is a Translucent glaze-type paint that lets the other paints show through. 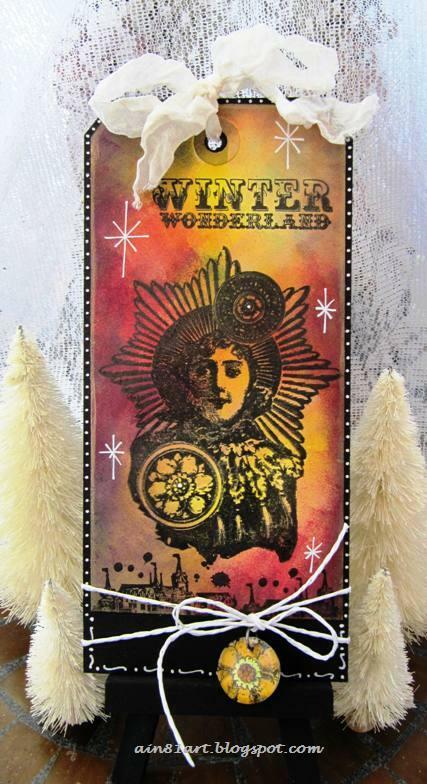 You must watch Leandra's wonderful video here to see her work with these gorgeous paints. They are AMAZING! This is the front. with a layer of London Night painted on the base ( it's an Opaque so it covers completely), and 2 layers of the paper added onto chipboard I cut out by tracing the large heart first, and cutting down. These are the pieces before I glued them to the front. The Cupid was painted with Fresco Paint Vintage Lace, then 2 layers of Claret are sponged on with Cut-n-Dry foam. When dry I added a layer of clear UTEE. This is the Medium Winged Heart with White Pen and a cutout heart glued on. The Cupid really turned out gorgeous with the Claret (a Translucent) and Clear UTEE. I cut out extra little Hearts from the Turquoise paper and glued here and there. The one Cupid is aiming at was added with a black foam square. The base has the London Night Fresco paint and White Pen marks around the edge. 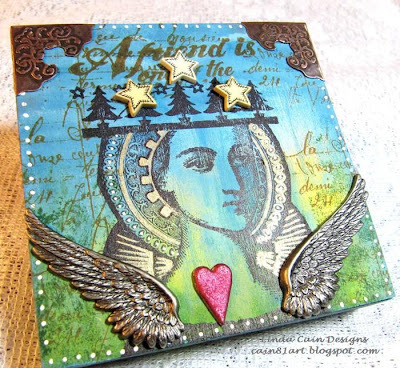 I applied Gold and Bronze UTEE to the Scalloped Heart here and used a cutout stamp from the paper pad. The Heart on the Front Base is covered with a cutout that has terrific little red and white letters. 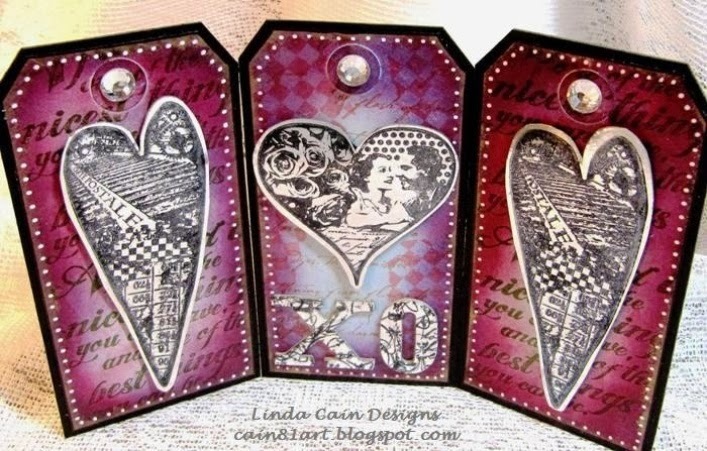 This section has "I (heart) U" in the center and is layered onto black chipboard. Really cute paper. I added a few white dots to the heart centers here and there just for kicks. These Bo Bunny papers were perfect to work with and I loved the color combos. So check out the links....order some Hearts, and make a fun Valentine that can sit on your Sweetheart's desk...or your desk just to make you SMILE! And leave a comment to let me know what you think....I LOVE hearing your thoughts! P.S. 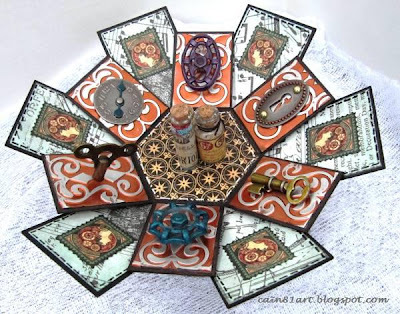 Don't forget to stop back for a peek at my projects for the 3rd Week of the Month Design Spot for Paper Artsy (the 21st)!!! I'll have the link and a look at my projects throughout the week...there will be 4 in all! So much fun using Fresco Finish Chalk Paints!!!! 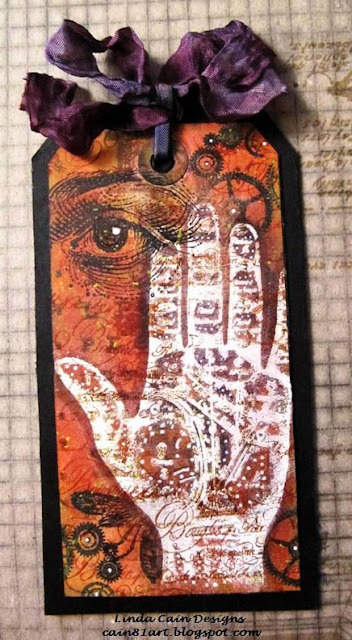 I cannot say enough about them....this is a tag I made using them, and the PaperArtsy Ink and the Dog Mini stamps. I'll lead you through the process. I applied the Fresco Paints with a piece of Cut-n-dry foam to a Manila Tag. I used Beach Hut, South Pacific, Autumn Fire and Smoked Paprika. I used Mini 05, 27, 48, 60, and 62 stamps...LOVE them ALL! Then I ran it through the Vagabond with a Cuttlebug Embossing Folder...the Numbers are my ALL-TIME Favorite. I had just gotten in my new stash of PaperArtsy Mini stamps, so I added bits and pieces of them with Jet Black Archival and Sepia inks. Then I took to the sewing machine and did 2 different stitches around it. I've had these pieces of die cut chipboard forever from Framedangoes. I pushed them into the black embossing inkpad, then dipped them into black UTEE. It only picked up some of the UTEE, and that was PERFECT. Heat it, and add some Peacock Feathers Distress Ink. The Gold Metal Sheet is stamped with Staz-On Jet Black ink and added to the back of the chipboard with Wonder Tape. I took a piece of Smoothy Super Smooth Card and added Vintage Lace, Mocha Mousse, and Beach Hut FP. Be mindful of the spot you want the baby's face. Mini 05. Stamp with Archival Ink and add a bit more of color with markers. Here they look a bit pinkish, but they're really light orange...honest. Then trim with decorative scissors and edge with a bit of Peacock Feathers Distress Ink. Use Peacock Feathers and Ripe Persimmon Distress Stains on some Crinkle Ribbon, crunch it up, dry and tie in a bow. 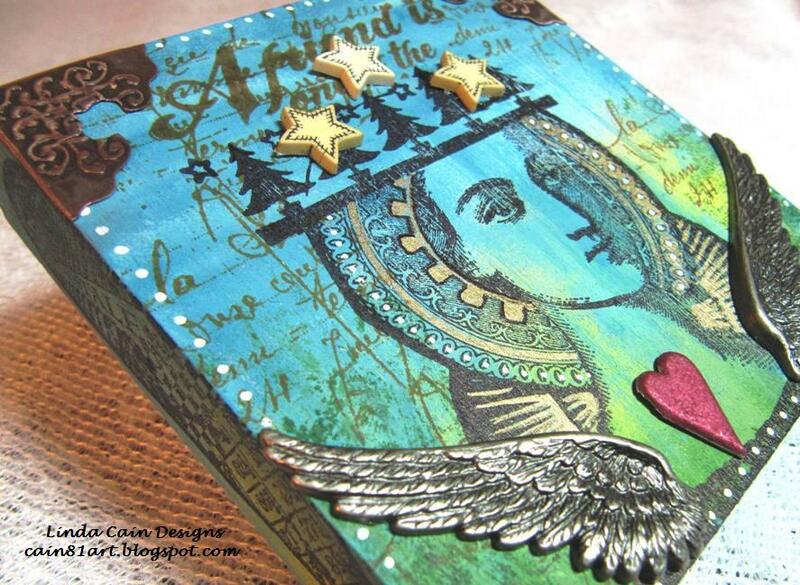 Add the stamped image and Chipboard pieces with foam tape and a gold brad in each one. That's it for today. Blogger has been on the fritz with uploading pictures for about 10 days...boo...so I had to use Picasa that takes much longer. Hope you enjoy, and check out the links above! What's new and exciting??? I'm designing for Retro Cafe ART!!!!! UPDATE!!! The link above takes you to the Medium Box Kit (as shown)...the wooden blocks, base and top are all from Hobby Lobby. Sorry for any confusion! 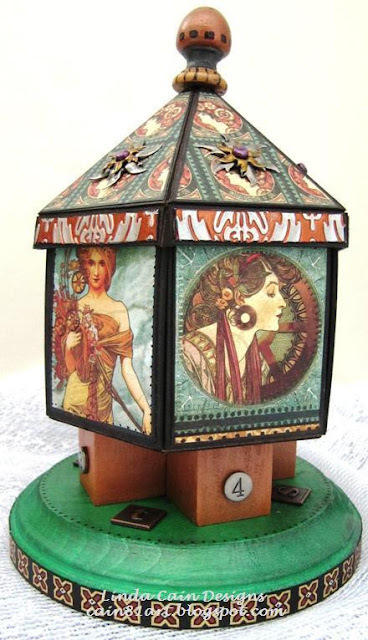 I will show you several steps to creating this piece...but first see the wooden base is painted with Ivy Green Liquid Pearls. The 5 Wooden Blocks are painted with the Chestnut Liquid Pearls. They are glued to the round base to form a platform. Get it??? You take the top off....and it EXPLODES to this really cool foldout. The bottom outside of the inner section was painted with Snowflake and various colors of orange Fresco Finish Paints from PaperArtsy. 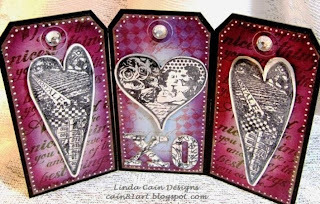 Then I stamped with Jet Black Archival Ink using Tim Holtz, Lynne Perrella, PaperArtsy Hot Picks, and Graphic 45 stamps. 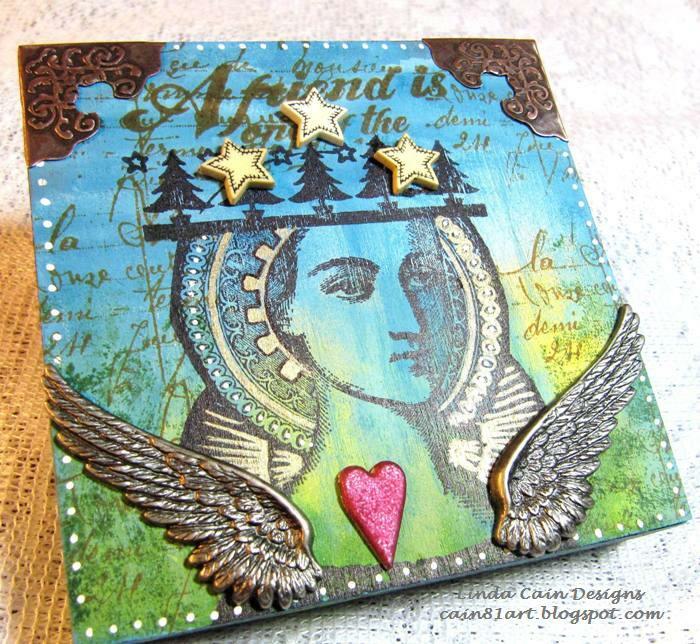 I'm telling you, stamping on Fresco Paints is AMAZING! Last, the Copper from Paper Artsy was embossed through the Vagabond and sanded to reveal the silver base. I added them with Wonder Tape. 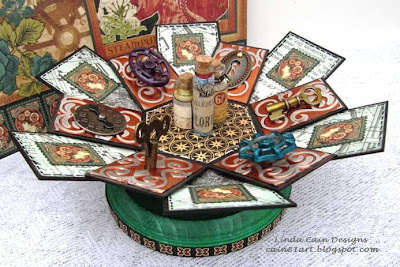 Lots of Idea-ology pieces, Faucet Knobs, a Clock Key, a Locket Key, a Timepiece Watchface, etc, were colored with Alcohol Inks and attached. Penwork here and there, and the Lady Postage Stamps from G45 are added to the Tissue Wrap layer. I added a bit of color with Pine Needles Distress Ink. The bottles were filled with micro beads, pearls, and sand. Then I glued different paper labels to them and tied waxed linen and colored wire around the tops. Once you have the 2 layers all decorated the way you like, you can use foam tape to adhere them at the centers. This is the lid before it's glued together. I always add black to the edges of most everything. If you've taken my classes, you know I am addicted to the Sharpie Chisel Tip Markers. The unfinished edge (shown here) was covered with more embossed Copper Metal. The little wooden top is painted with Liquid Pearls and a black permanent marker before it's glued into place. It's hollow so it worked great...it's from the Wood Shop. This whole kit comes flat and you can decorate it before it's glued together. Makes it so easy to stamp and paint. This is a view of the inside as it opens. See how nice the stamping shows up on the Fresco Paint? I made a video to show you this opening...it's my first one on the blog, so if it doesn't work very well, I'll just have to keep trying. Click the arrow to start it. Have a good one! And let me know what you think! It was a very, very good year for me. I've learned a LOT about so many different things to do with ART. I've been published a couple of times, and asked to teach here and there, met some wonderful new friends, and been blessed with new and exciting products to work with. So, I thought I'd show you my favorite projects for the past year. Got this idea from my dear friend Lynne Forsythe. Several have tutorials on the posts...click on each title to take you to that post. I know I had the time of my life making these and will treasure all the friends I made along the way through them. 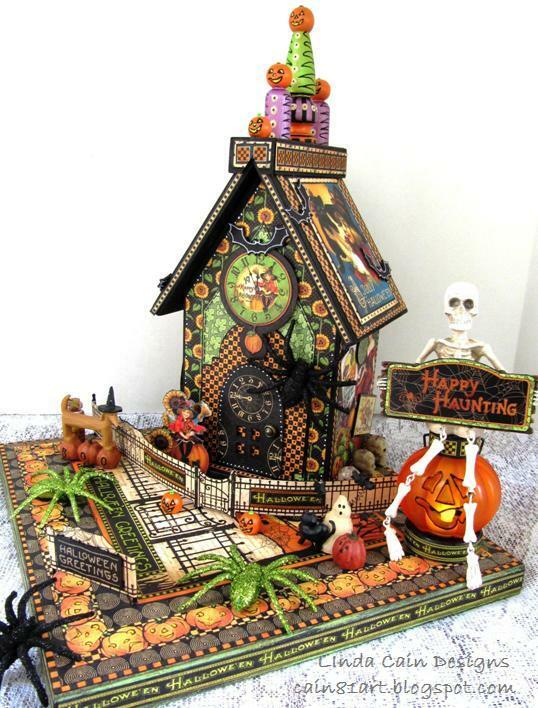 And last but not least....the Tower House Trio. So we're moving into a new and exciting year with new products to play with and the first 4 months of the year as Paper Artsy Guest Designer!!!! Check me out on their blog every 3rd week for the next 4 months here. You will LOVE the Fresco Paints.and the GORGEOUSLY detailed stamps..I'm telling ya, I fell in love with them.